In memory of the Rev. 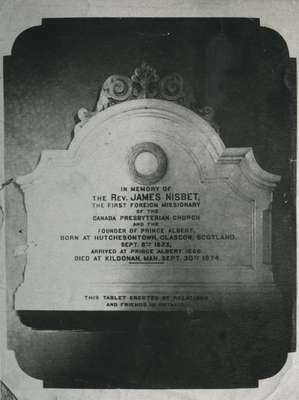 James Nisbet, the first foreign missionary of the Canada Presbyterian Church and the founder of Prince Albert, born at Hutchesontown, Glasgow, Scotland. Sept. 8th, 1823, arrived at Prince Albert, 1886. Died at Kildonan, Manitoba. Sept. 30th, 1874. This tablet erected by relations and friends in Ontario.